My friend told me that her chickens love comfrey so much that she can’t keep them out of it. So I was excited to think that I could supplement my hens’ diet with the comfrey that is growing rampant in my garden and pasture. I setup the chicken netting around the comfrey patch, opened the coop and stood back to watch them – ignore it. They won’t eat it. They do not like it fresh or dried. The comfrey in the chicken run has grown so tall that it produces great shade and the hens do love to lay under it dust bathing. But they won’t eat it. Maybe comfrey is an acquired taste. 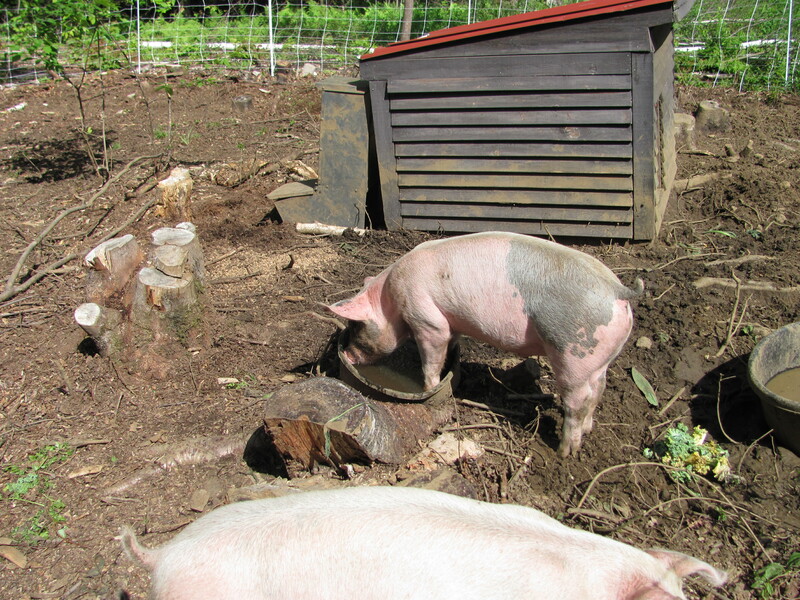 Pigs dunking comfrey in water trough. The pigs, on the other hand, love comfrey. Fresh or dried, flowering or not, they come running when Ron brings them a handful of comfrey. As soon as they hear the tractor engine start up, they start running circles around their pig house in anticipation. After he dumps it over their fence, they it scoop up and drop it in their water bucket. Then they swish their snouts around under water, blowing bubbles and gathering a mouthful – munching greedily. It’s not pretty but it is entertaining. The nice things about comfrey is that it has a long taproot which draws all the lower nutrients up to the soil’s surface – called an accumulator in the permaculture world and highly prized. The plant is also called “knitbone” since it is thought to help heal broken bones. A comfrey tea can be used for fertilizer and even though it is purported to stink, I am anxious to try it in my garden. And, although I cut it often for the pigs or to mulch around my vegetables, it rebounds with a vengeance. In 2014, I am going to experiment with wilting comfrey for a day and then lining half of my potato trenches with a 2″ layer to supply additional potassium and protecting them from scab. Comfrey is also an excellent addition to the compost heap because of all those nutrients you describe. Good point! I am surprised when I heap up the compost pile with comfrey to find it decomposed in only 2 days. There is a lot of nutrient rich moisture stored in those leaves.